DAY 43. 19 JUNE 2016. OVIEDO HOLIDAY. Up and out fairy early. It's a sunny day. The stag-party were out on the town all night so it was a peaceful night after all. It's an hour's walk into the Old Town along the beach, where I book into my student residence accommodation. It's very nice for €15 and includes breakfast and laundry. I have my own single room with shower too. A good find! It's next to the ruined Roman wall in the old part of town. Then off to find the bus station to see Oviedo. It's very strange to be travelling so fast. I realise that walking gives a very fine-textured view of the fabric of the world. I can see individual leaves and cracks in the paving stones. The detail on the manhole covers or the unimaginable complexity of the silhouette of the mountains on the horizon. I can stop at any time to relate to it. Potential ugliness is mitigated, or perhaps I'm distracted, by the fineness of other details. A patch of buttercups, birdsong or a darting lizard. Now I'm whizzing along in a blur and I feel a sudden disconnect; the slowness and embodiment of walking is important. It allows time for the world to offer its consolation and our bodies a way to reciprocate. I have a feeling that speed is one of the disorientating aspects of modern life. A friend sends her soul ahead of her prior to travelling long distances by plane; now I understand. So I arrive at Oviedo bus station and walk through the rather grim new town to its historic core. 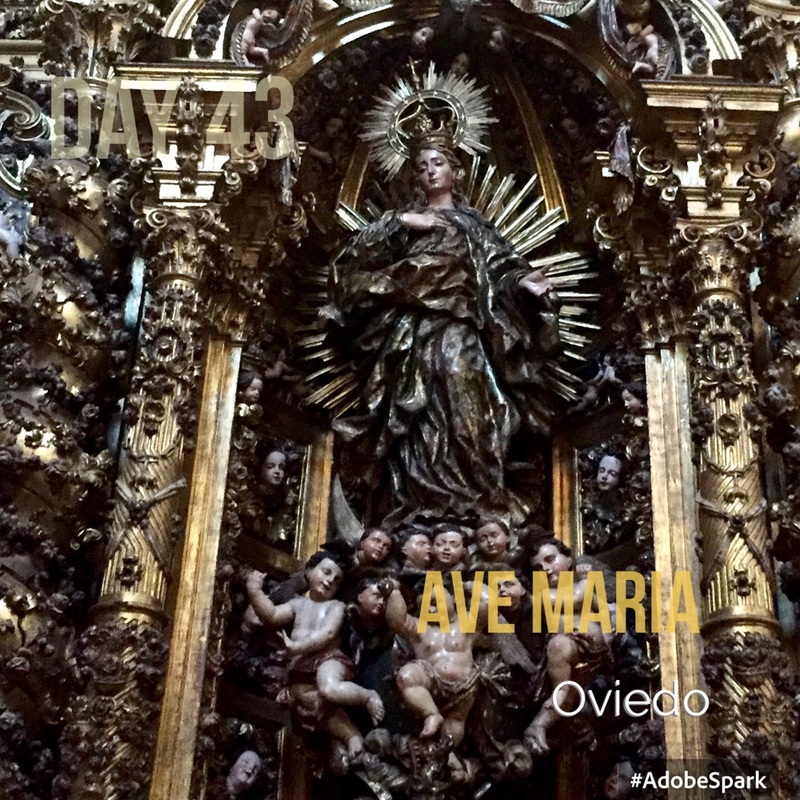 The cathedral is large, ornate Gothic and holds lots of iconography of the Virgin in her various manifestations. The Asturian 'Señora de Covadonga' is the local apparition of the Virgin Mary. Her ancient shrine is perched over a huge waterfall up in the Picos and I suspect that she is a pre-Christian water goddess that the Church took under its wing. She wears a distinctive triangular robe and stands on the heads of three little girls? holds a rose in one hand and a crowned Child in the other. There is Mass in progress in a side chapel and I squeeze in at the back. The priest has a lovely singing voice and chants some of the liturgy. The reredos glows gold, Our Lady of Covadongo looks passively on and the priest sings descant to the congregation - no instruments. Unremarkably beautiful. When the service finishes the candles are extinguished, the rood screen is closed and locked and the light turned out. We leave. I wander around for a while and pop into one of the myriads of tourist shops and buy my first souvenir. A tiny painted plastic Señora de Cavadonga; she's about 60mm high. It's an interesting image because the Child is looking not at us as is usual, or at Mary but sideways at the rose. The three little heads underneath are also intriguing. At the tourist office they tell me that the A2 bus will take me to a nice Romanesque church outside the city or I can walk in 30 minutes so off I go to catch the bus. I'm on it for 3 minutes when I spot a troupe of Asturian bagpipe players and dancers in traditional dress. I'm off the bus in a flash. After yesterday's visit to the bagpipe museum it's great to see the real thing in action and dancers with tambourines and castanets. The bass drum player is a dark rotund man, like a Tolkien dwarf about 4 foot tall. It's very moving for some reason. This isn't remotely Flamenco. More like a sedate Scottish Country Dancing. Then I decide to get back on the bus to visit the Romanesque churches, but discover the next bus is in 33 minutes. I should have waited but tried to walk. The map was hopelessly out of scale and after 40 minutes uphill slog I realised I was going to miss the 1pm deadline to visit the interior. Since I've seen hundreds of Romanesque churches from the OUTSIDE this trip, I decided to come back next year, turned round and had some lunch instead. Very nice dried beef and then polpo (octopus is a regional speciality). Lunch is the main meal for the Spaniards- they do small sugary breakfasts and eat supper at 8-9pm. The region is famous for octopus and I had to try some. Very tender. The restaurant/bar is slowly filling up with good friends. This must be a Sunday ritual. The women are dressed-up and greet each other with kisses; everyone is tucking into something delicious! I've walked about 12 miles today - I seem to do as many miles on my days off as I do walking between albergues. The difference is that I don't carry my 8kg pack and that's a big difference. The only word is iconic. So I head back into the centre of Ovieto and discover a monumental 'space ship' of a building by the Spanish engineer Calatrava (who designed the curved bridge in Bilbao and Avignon station). It says on the map that it's the 'Palacio de Congresos Princesa Letizia.' Sounds and looks like something out of Star Wars, but it is an amazing statement. It must have cost a lot of money. On my way back from the station I'm approached by a dodgy looking man who I think may have hacked my iphone. Sadly there's nothing I can do about it on Sunday evening, but I need to call Orange tomorrow. Yikes. A huge bowl of delicious sea-food soup with crab legs and clams for supper with real bakery bread and a glass of white wine, followed by tea with cold milk - not quite the same as a homemade brew but almost. I stroll back through the busy streets bustling with strolling and dining Spaniards to my student residence where my clean washing awaits hanging on my door. Ah. One of the Soaring gold reredos in the Cathedral.